Here you will find information formatted for journalistic needs including photos, biographies, FAQ’s, and suggested books on Tull. Press kits featuring high res images for Jethro Tull’s 50th Anniversary tour. Download below. A press kit featuring high res images and biography for Jethro Tull’s ‘The String Quartets’ album. Download below. A press kit featuring high res promo images for ‘Jethro Tull by Ian Anderson’ tour. Download below. The following is an imaginary interview of the sort which I do several times a day at the peak of promotional activity, and where the most common topics eat up valuable time, thereby reducing the number of interesting and original questions and answers which might have been fitted in. How did you get the name Jethro Tull? Back in February, 1968, we had many different names which usually changed every week, since we were so bad that we had to pretend to be some new band in order to get re-booked in the clubs where we aspired to find fame and fortune. Our agent, who had studied History at college, came up with the name Jethro Tull (an eighteenth century English agricultural pioneer who invented the seed drill). That was the band name during the week in which London’s famous Marquee Club offered us the Thursday night residency. So it stuck. Is it too late to change? I thought so. Who are the current band members? 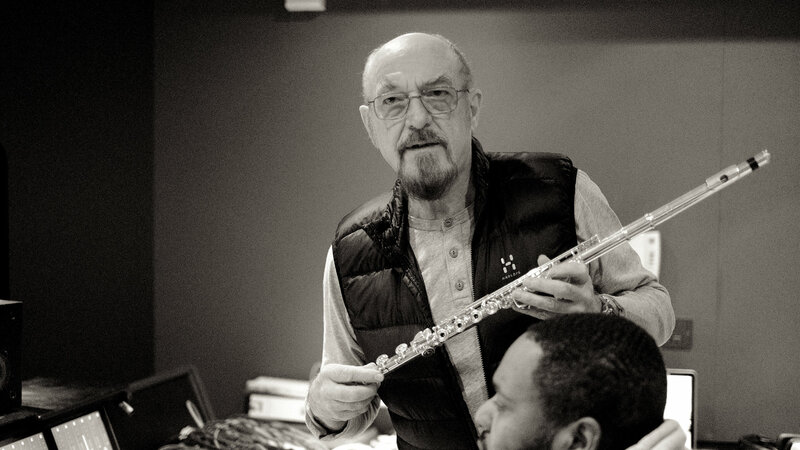 Ian Anderson, on flute, vocals and acoustic guitar. Florian Opahle on Electric guitar. Scott Hammond on drums. John O’Hara on keyboards and David Goodier on bass. With the additional vocal and theatrical input of Ryan O’Donnell on stage. Why have there been so many changes in line-up over the years? Lots of different reasons. Some of the boys left to get married, settle down, form their own bands, that sort of thing. Jeffrey Hammond-Hammond left to be a painter. John Glascock tragically died from a heart disease. And two were fired. We are all pretty good pals now. Like a big extended family of two football teams. In 1976, you named a famous Tull track “Too Old To Rock And Roll”. What do you feel about this title, looking back on it now? It was not, then or now, an autobiographical statement. It was an album track which was about the cyclic changes of fashion in culture, pop and rock music. Quite predictive for 1975 really, given the endless recycling of 60’s and 70’s musical influences which fill the charts these days. In 1973, Jethro Tull disbanded following the bad reviews of “A Passion Play”. Why? No, we didn’t! Our then manager decided to respond to a bad review in the influential pop newspaper Melody Maker by cutting a deal with the editor for a front page “scoop” involving the band’s supposed decision to quit. We knew nothing about it until we read it in the paper ourselves, and we were furious. It made us look petulant and silly. Which we probably were, but we didn’t need the wrong kind of publicity. Tull have never disbanded, even for a moment. No come-back tours for us, thank you very much. We haven’t yet been away! Are you, like the song, “Living in the Past”? I am not one for nostalgia or reminiscences and prefer to live in the present and the future. However, some of our audience obviously like the nostalgia bit, and the older material which we play is, for them perhaps, a trip down memory lane. For us, it’s not about playing a song which could be thirty years old. It’s about playing something 24 hours old, since that’s when we probably last played it on stage. Our style of music is, I hope, a little bit timeless and not rooted in a particular music fashion. Pop and Rock music have changed a great deal over the last 30 years. How do you view these changes? And do you listen to the new music like Techno and Rap? Well, the really big changes were back in the early years of the mid-to-late sixties and the early seventies. The introduction of musical influences from many diverse world cultures and historical periods provided for a rapidly evolving and richly creative musical environment. Folk, Classical, Blues, Jazz and Asian motifs and forms broadened the scope of American-derived pop and rock. Tull were a part of that evolution. Since the mid-seventies, the development has been more technological rather than musical. Sampling, synthesis, sequencing and the personal home computer revolution have brought music making to the masses at an affordable price. But the music goes round in circles. Same old simple rhythms, melodies, harmonies and verse/chorus/bridge song structures. Nothing really changes: nothing is really new. But each new generation of young musicians rediscovers the wheel, The Beatles, sunglasses and stretch limousines. As long as they and their fans think it is new, why disappoint them? Give the kids a pot of paint and they will repaint their house. Same old bricks underneath. Techno and Rap? Just nursery rhymes with attitude. Nice idea but going round in very small circles. You are now one of the old men of rock – over 66 years of age. How long do you plan to go on performing and recording? As long as it remains a challenge and my health permits. One year: ten years – who knows? Then there are painting, writing and other creative indulgences to consider. Which will go first: the eyes, ears or the hands? Fear of boredom in old age is my greatest concern. Do you have Family? A wife? Children? Where do you live? I enjoy the company and love of my wife of 42 years, Shona, two children, James and Gael, three cats, two dogs and some chickens. We live in an eighteenth century English country house with a recording studio, 400 acres of grassland and 30,000 trees situated about 100 miles west of London. Disgusting isn’t it? Want to swap? Thought so. Is it true you are also a fish farmer? How did you get interested in that hobby and will you retire from music to concentrate on it full-time one day? In 1978, we bought a second home in Scotland, where I was born. We were looking for some way to off-set the cost of owning the property and I read, in an airline magazine as I recall, an article about Aquaculture. We set up a Salmon farm at the beginning of that new industry’s development. A smoking and processing factory and more fish farms followed and the businesses collectively employed about 400 people in the Highlands of Scotland. But that was back in the 80s and 90s. The New Millennium brought about the harsh reality that I had to choose between being a full-time musician or devote more time to commercial business. More fun being a flute-player than a fish-salesman, I decided. Death may beckon, but retirement does not so, a deep breath, a clearing of rusty throat and off we charge, flute flailing, wailing but not failing. Into the sunset…..
Do you listen to new bands and who are your favourites? I receive rather a lot of unsolicited demo tapes and CD’s from would-be musicians as well as from more professional performers, so I listen to a lot of “new” stuff that way. The car radio and music television keep me as informed as I want to be. But I have never been a great listener of other people’s work. Even when I first started, I listened only to a few things which really caught my attention. My favourite music to listen to these days is that of Muddy Waters, Beethoven and Indian Classical and pop music. Jethro Tull and Ian Anderson are amongst the legends of Rock. Why do you think the band has lasted so long? The loyalty of our fans keeps us in work and pocket money. Some artists have fickle fans who have short attention spans. More loyal and committed fans ensure that the work of some bands like Zeppelin, The Grateful Dead, Hendrix and the Stones won’t fade away. Tull is just a lesser version of those rock giants whose music will go on to define the form in the history books of the future. Early in 1968, a group of young British musicians, born from the ashes of various failed regional bands gathered together in hunger, destitution and modest optimism in Luton, to the north of London. With a common love of Blues and an appreciation, between them, of various other music forms, they started to win over a small but enthusiastic audience in the various pubs and clubs of Southern England. The breakthrough came when they were offered the Thursday night residency at London’s famous Marquee Club in Wardour Street, Soho. The early Jethro Tull released their first Blues-oriented album, This Was, in the latter part of 1968 before moving on to more home-grown and eclectic efforts in 1969 with Stand Up and a flurry of single releases, including Living In The Past, in the UK market. Benefit, Aqualung, and Thick As A Brick followed and the band’s success grew internationally. 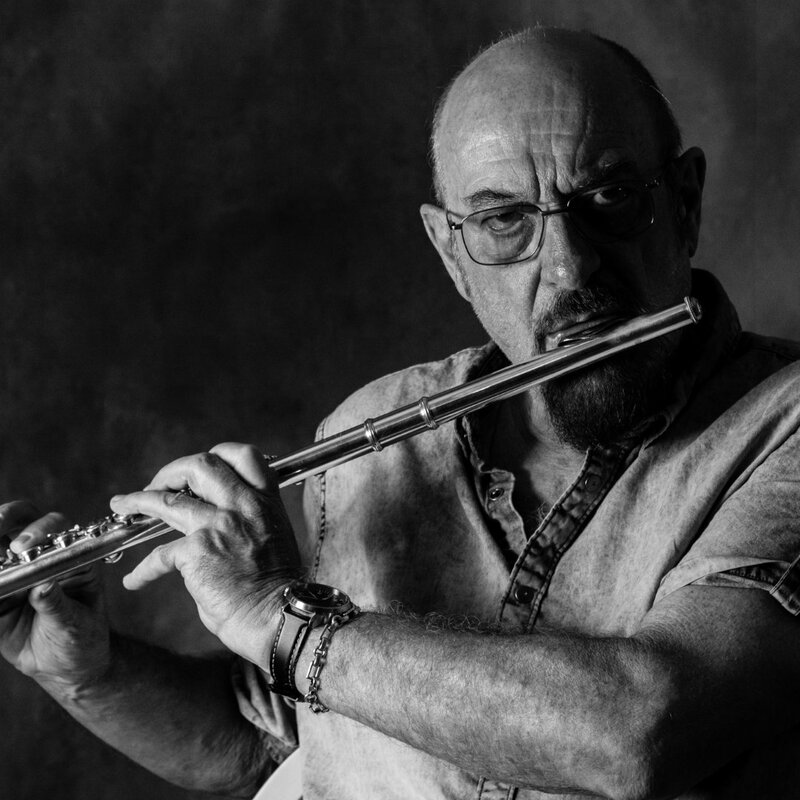 Various band members came and went, but the charismatic front man and composer, flautist and singer Ian Anderson continued to lead the group through its various musical incarnations. Jethro Tull were, by the mid-seventies, one of the most successful live performing acts on the world stage, rivalling Zeppelin, Elton John and even the Rolling Stones. Surprising, really, for a group whose more sophisticated and evolved stylistic extravagance was far from the Pop and Rock norm of that era. With now some 30-odd albums to their credit and sales totalling more than 50 million, the apparently uncommercial Tull have continued over the next three decades to travel near and far to fans across the world. 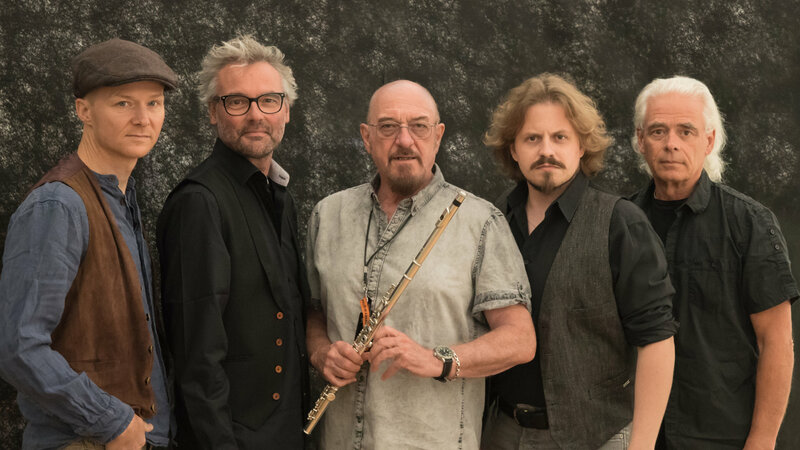 After forty years at the bottom, at the top and various points in between, the Tull repertoire is still performed typically more than a hundred concerts each year by Ian Anderson on his continuing tours throughout the world. Ian remains at the centre of a group of sometimes changing but highly capable – indeed excellent – musicians. The band continue to delight audiences everywhere and present the ongoing legacy of Tull’s music with its rich variety and depth of expression wherever the fans, young and old, want to hear Rock, Folk, Jazz and Classical-inspired music for grown-ups. 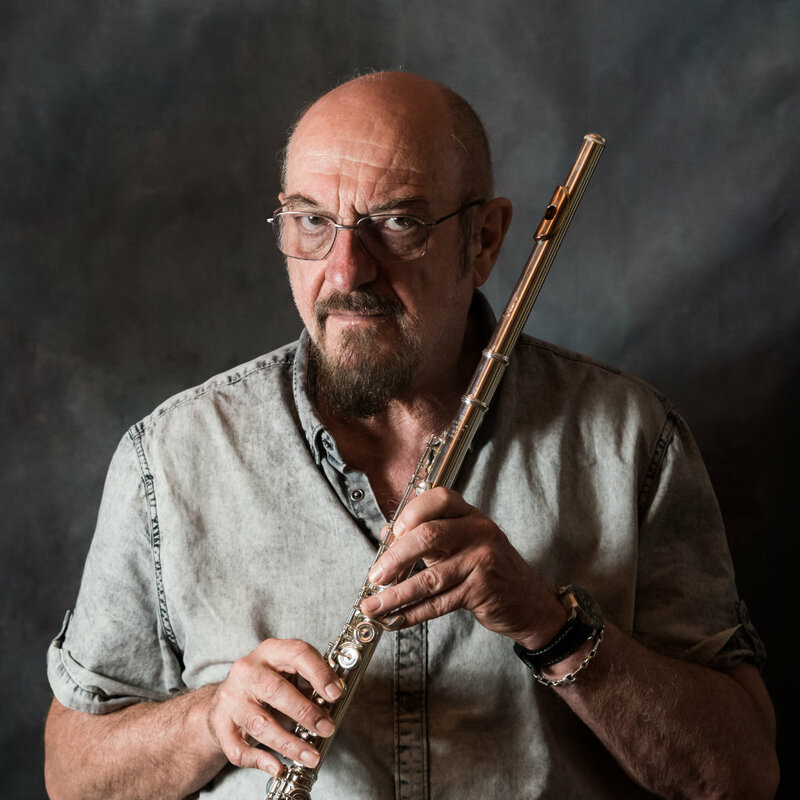 Ian Anderson, known throughout the world of rock music as the flute and voice behind the legendary Jethro Tull, celebrates his 51st year as a recording and performing musician in 2019. Ian was born in 1947 in Dunfermline, Fife, Scotland. After attending primary school in Edinburgh, his family relocated to Blackpool in the north of England in 1959. Following a traditional Grammar school education, he moved on to Art college to study fine art before deciding on an attempt at a musical career. Tull formed in 1968 out of the amalgamation of the John Evan Band and McGregor’s Engine, two blues-based local UK groups. After a lengthy career, Jethro Tull has released 30 studio and live albums, selling more than 60 million copies since the band first performed at London’s famous Marquee Club in February 1968. After undertaking more than 3000 concerts in 40 countries throughout five decades, Tull has played typically 100-plus concerts each year to longstanding, as well as new fans worldwide. 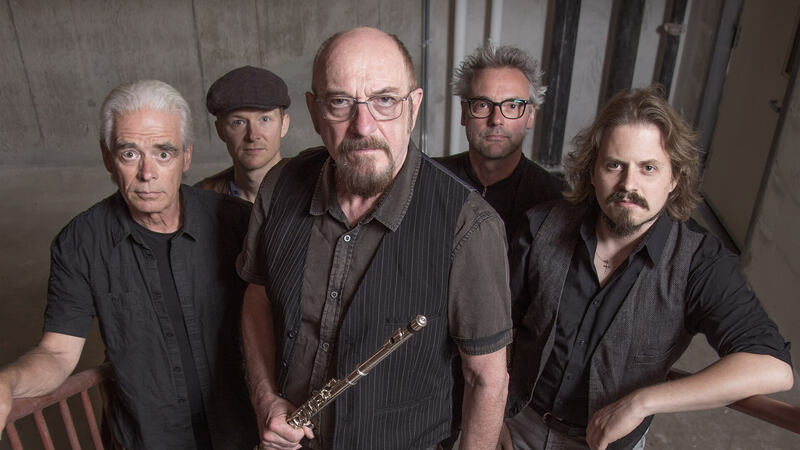 He continues to celebrate 50 years of Jethro Tull with various dates in the USA and elsewhere in the world. 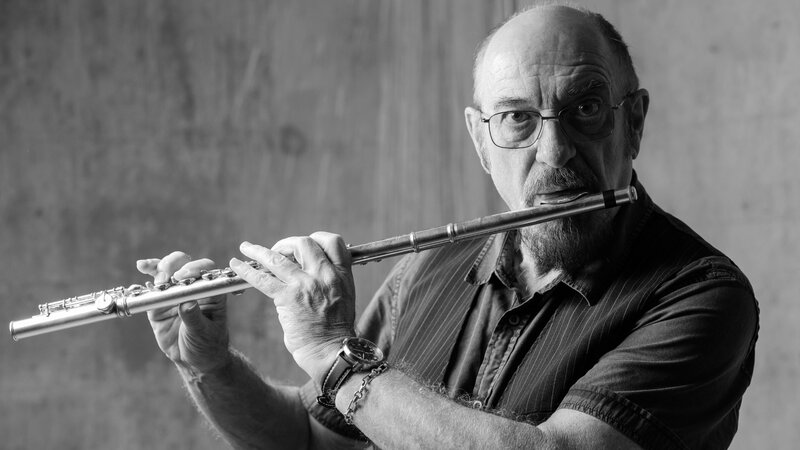 Widely recognized as the man who introduced the flute to rock music, Ian Anderson remains the crowned exponent of the popular and rock genres of flute playing. So far, no pretender to the throne has stepped forward. Ian also plays ethnic flutes and whistles together with acoustic guitar and the mandolin family of instruments, providing the acoustic textures which has been an integral part of most of the Tull repertoire. Anderson has so far recorded seven diverse solo albums in his career: 1983’s “Walk Into Light”, the flute instrumental “Divinities” album for EMI’s Classical Music Division in 1995 which reached number one in the relevant Billboard chart, the acoustic collections of songs, “The Secret Language of Birds”, and “Rupi’s Dance”. In a more progressive rock context he recorded “Thick As A Brick 2” in 2012 and “Homo Erraticus” in 2014. Released in 2017, the classically inspired album “Jethro Tull – The String Quartets” with the Carducci Quartet reached number one in the Billboard Classical Charts. In recent years, he has toured more and more under his own name in solo concerts with orchestras, string quartets, featured soloists and in his other eclectic acoustic shows. Concerts scheduled for 2019/20 will also feature some new work as well as the reprise of some surprise earlier Jethro Tull repertoire, unplayed for many years. Anderson lives on a farm in the southwest of England where he has a recording studio and office. He has been married for 42 years to Shona who is also an active director of their music and other companies. They have two children – James and Gael – and two grandchildren. Gael is married to actor Andrew Lincoln, currently shooting more episodes of the award-winning zombie thriller, The Walking Dead playing now on a television near you. His hobbies include the growing of many varieties of hot chile peppers, the study and conservation of the 26 species of small wildcats of the world and the appreciation of mechanical watches, fountain pens and vintage cameras. He reluctantly admits to owning digital cameras and scanners for his work on the photographic promotional images related to Tull as well as his solo career. In 2006, he was awarded a Doctorate in Literature from Heriot Watt University in Edinburgh, the Ivor Award for International Achievement in Music and, in the New Years Honours List 2008, an MBE for services to music. In 2011, he received another Doctorate in Literature from Dundee University. Ian owns no fast car, never having taken a driving test, and has a wardrobe of singularly uninspiring and drab leisurewear. He still keeps a couple of off-road competition motorcycles, a few sporting guns and a saxophone which he promises never to play again. He declares a lifelong commitment to music as a profession, being far too young to hang up his hat or his flute, although the tights and codpiece have long since been consigned to some forgotten bottom drawer.